BOTTOM LINE: Western Power Summit brings together existing and emerging leaders and innovators from across the West’s electric power sector, including investor-owned utilities, federal power agencies, cooperatives, independent power producers, and municipal power agencies, leading Prosumers, public policy leaders, financial executives, policy makers and sector innovators, among others. This is the perfect opportunity to showcase your brand and convey your company's message to the best of the best. 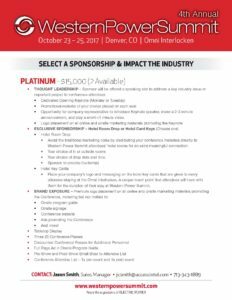 If you're interested in maximizing your visibility, secure your Western Power Summit sponsorship today! 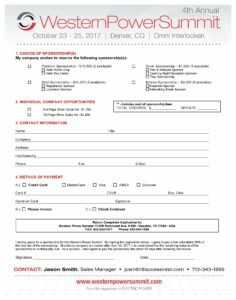 Please contact Jason Smith at jcsmith@accessintel.com or 1-713-343-1889 to discuss your sponsorship options. Opportunity for company representative to introduce Keynote speaker, make a 2-3 minute announcement, and play a short <1 minute video. Avoid the traditional marketing noise by distributing your conference materials directly to Western Power Summit attendees’ hotel rooms for an extra meaningful connection. Place your company’s logo and messaging on the hotel key cards that are given to every attendee staying at the Omni Interlocken. A unique touch point that attendees will have with them for the duration of their stay at Western Power Summit. Contact Jason Smith, Sales Manager, at 713-343-1889 to discuss these opportunities.